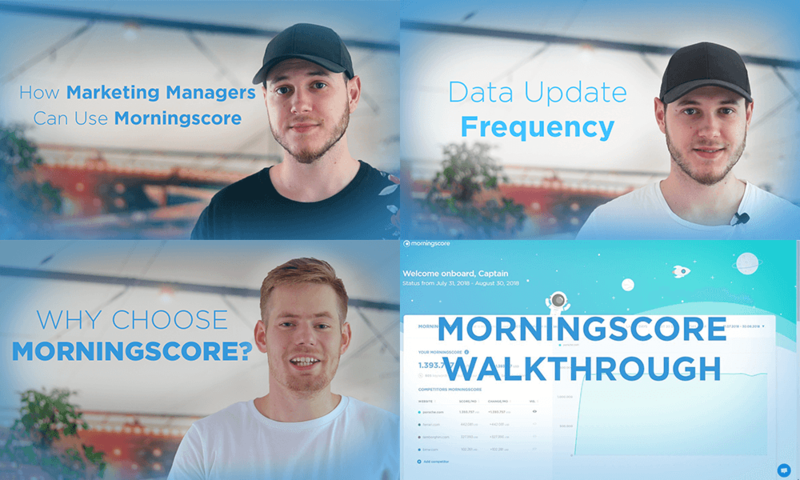 Here you’ll find answers to the most frequently asked questions and ways to get even more out of Morningscore. BE A LEADER! Start exploring your websites SEO value in $ in less than 2 min. • Can I Get A Morningscore Walkthrough? • Is Morningscore For Marketing Managers? • What Does The Main Metric Stand For? • How Often Do You Update The Data? links you have lost so you can get them back. • What is a Morningscore (how do you get this number)? Morningscore was created to let you measure the value of your organic traffic. It is calculated by multiplying the number of monthly clicks from Google to your website (your monthly traffic) and the price you would pay for the clicks in Google AdWords. So, we take each and every keyword that you rank for, check how much traffic you get for it every month and how much that precise traffic would cost you if you were paying for it through Google AdWords. When all the keywords are added, you have a Morningscore. • What can I use my Morningscore for / how does my Morningscore bring me value? • Why choose us?/What do we offer that others don’t?/What makes us special? Morningscore provides you with the combined data from the best tools available to a third of the price of other tools. We summarize and simplify the important stuff making it more understandable for non-SEOs and giving an overview with useful insights to SEO gurus. • Where do I change language? Open your Settings from the menu, scroll down to System language and choose a language. • How do I track my domain through multiple locations/markets? Click on the Websites in the menu, add the same domain multiple times, but choose a different location every time you add it. You are now able to track it for these markets. • Why is the spaceman looking for my data and how long will this take? Once you add your domain/s it will take a while for our crawler to fetch your data. This will typically take between 2 and 24 hours. • You might have a big amount of data that is taking longer to process. What you should do in this case is contact us through the chat so we can help you solve this problem. • How do I change the currency for my Morningscore? Open your Settings from the menu, scroll down to System currency and choose one from the drop-down menu on the right. • Where can I find all the keywords that I already rank for? In the Morningscore overview window, click the “See calculation” to get a list of all the keywords you are currently ranking for. Here you can also see their search volume, rank, traffic, CPC in your chosen currency and how much they are contributing to your Morningscore. • Where can I see my rank history? In the Keywords report use the “Add keyword” button to add keywords you would like to track. If you already rank for it you will be able to see the rank history in the rank column. There will be an arrow and a number displayed in superscript showing changes in your rank for the time period you have selected. • What are the link values? 4 arrows: DA 70 and above. • How do I see my competitor’s keywords, keyword ranks and rank history? window. The first way is to click on the See calculation link right underneath your Morningscore. You will see a list of keywords that contribute to your own morningscore. In the top left corner, you can click on the name of your domain and choose a competitor from the drop-down menu instead. The second way of accessing competitor keywords is by clicking on the competitor in the list underneath your Morningscore. • How do I see my competitor’s backlink list? If you add your competitor’s website as one of the domains you are following, you will have access to the link report with all your competitor’s links, including the lost and new ones. Stay tuned for more FAQ updates! In the meantime, you might wanna check our Galaxy Tour guide. This is a compendium of all our guides and it will help you get started with Morningscore. Here you can find step-by-step instructions to selecting the right keywords for your business, grabbing low hanging SEO fruit, jumpstarting your link building strategy and determine if your Morningscore is good or bad. • Morningscore can’t find my data – why should I use it? To get your data, we use 4 data suppliers that send us a fresh index every day. If none of them were unable to find data for your website, it means it doesn’t really rank on Google on a position below 100 for any keyword. However, Morningscore is a different than most SEO tools on the market. Typically, what’s currently out there works mostly like a database — you pay to get access to the data and then it’s all up to you what you can make of it. On the other hand, Morningscore actively helps you improve your SEO by giving you suggestions on what you need to explore and how your competitors go about SEO. The tool also focuses on saving you time and energy by offering the most important aspects of your SEO instead of every single in-depth data point. So in a sense, if you consider SEO an important channel for your marketing, Morningscore can help — and it’s also free for 14 days.